A stem is one of two main structural axes of a vascular plant. 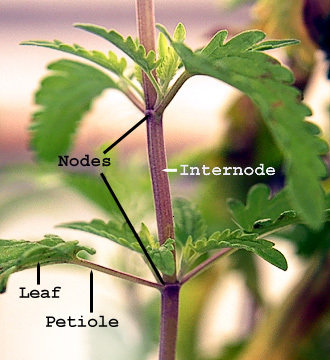 The stem is normally divided into nodes and internodes, the nodes hold leaves, flowers, cones, axillary buds, or other stems etc. The other main structural axis of plants is the root. In most plants, stems are above the soil surface but some plants have underground stems called stolons or rhizomes. Support for leaves, flowers and fruits. The stems keep the leaves in the light and provide a place for the plant to keep its flowers and fruits. Transport of fluids between the roots and the upper parts in the xylem and phloem. The production of new living tissue. Stems have tissue called the meristem which contains dividing cells. This produces new living tissue. The normal life span of plant cells is one to three years. Much of the longer-lasting tissue in trees consists of cells which are no longer living. 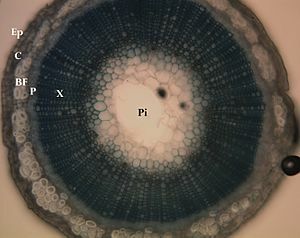 Bark and xylem vessels are examples of this. Bulb - a short vertical underground stem with fleshy storage leaves attached, e.g. onion, daffodil, tulip. Bulbs often function in reproduction by splitting to form new bulbs or producing small new bulbs termed bulblets. Bulbs are a combination of stem and leaves so may better be considered as leaves because the leaves make up the greater part. Tree - a woody stem that is longer than 5 meters with a main trunk. Thorns - a reduced stem with a sharp point and rounded shape. e.g. hawthorn. The most important tissue inside the stem is the vascular tissue. This plays a major part in the transpiration of water and nutrients. There are many hollow tubes, including the xylem vessel and schlerenchyma fibres. The phloem contains living tissue. There are thousands of species whose stems have economic uses. Stems provide a few major staple crops such as potato and taro. Sugar cane stems are a major source of sugar. Maple sugar is got from trunks of maple trees. 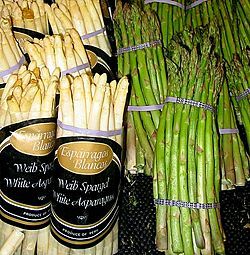 Vegetables from stems are asparagus, bamboo shoots, cactus pads, kohlrabi, and water chestnut. The spice, cinnamon is bark from a tree trunk. Cellulose from tree trunks is a food additive in bread, grated Parmesan cheese, and other processed foods. Gum arabic is an important food additive obtained from the trunks of Acacia senegal trees. Chicle, the main ingredient in chewing gum, is obtained from trunks of the chicle tree. Medicines obtained from stems include quinine from the bark of cinchona trees, camphor distilled from wood of a tree in the same genus that provides cinnamon, and the muscle relaxant curare from the bark of tropical vines. Wood is a used in thousands of ways, e.g. buildings, furniture, boats, airplanes, wagons, car parts, musical instruments, sports equipment, railroad ties, utility poles, fence posts, pilings, toothpicks, matches, plywood, coffins, shingles, barrel staves, toys, tool handles, picture frames, veneer, charcoal and firewood. Wood pulp is widely used to make paper, cardboard, cellulose sponges, cellophane and some important plastics and textiles, such as cellulose acetate and rayon. Bamboo stems also have hundreds of uses, including paper, buildings, furniture, boats, musical instruments, fishing poles, water pipes, plant stakes, and scaffolding. Trunks of palm trees and tree ferns are often used for building. Reed stems are also important building materials in some areas. Tannins used for tanning leather are obtained from the wood of certain trees, such as quebracho. Cork is obtained from the bark of the cork oak. Rubber is obtained from the trunks of Hevea brasiliensis. Rattan, used for furniture and baskets, is made from the stems of tropical vining palms. Bast fibers for textiles and rope are obtained from stems include flax, hemp, jute and ramie. The earliest paper was obtained from the stems of papyrus by the ancient Egyptians. Amber is fossilized sap from tree trunks; it is used for jewelry and may contain ancient animals. Resins from conifer wood are used to produce turpentine and rosin. Tree bark is often used as a mulch and in growing media for container plants. Decumbent stem in Cucurbita maxima. This above-ground stem of Polygonatum has lost its leaves, but is producing adventitious roots from the nodes. The trunk of this redwood tree is its stem. Plant stem Facts for Kids. Kiddle Encyclopedia.